The First and BEST Transformers mod around! at this stage it is basically functional, Transformations Several alternate mode classes Full Deathmatch action Single player supported New Graphics Replaced Enemies Fight The Decepticons or Destroy the Autobots! Transform Your Gameplay!! Check out the homepage, the screenshots say it all! Soon To Come: Hi-Res Graphics(Via New GL Renderer! ), More Weapon Replacements, Full CTF Support, TEAMPLAY Support,COOP Support, and More!. 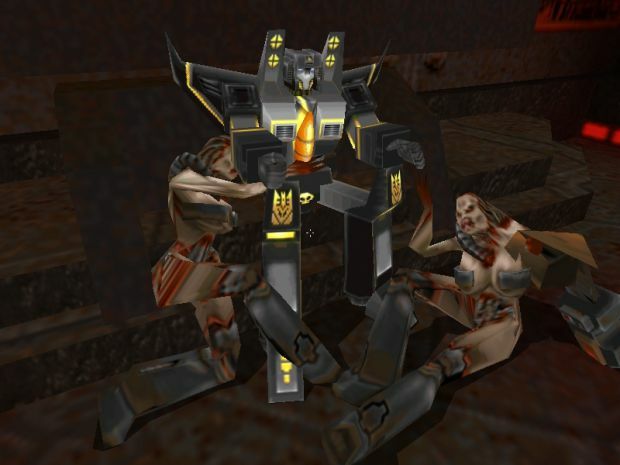 TRANSFORMERS QUAKE II 10th anniversary edition, Everything you need is in this install, all the maps, players and textures that are finished as of today are included. This supersedes the player pack and map packs, everything in one go! Install quake2, then install this and your good to go!